Cooking games have always found a welcoming home on Nintendo platforms over the years. From the Cooking Mama series to the recent and popular Overcooked franchise, when it comes to games that let you don your chef hat, you’re sure to find them on a Nintendo system. One such newcomer, Food Truck Tycoon, allows you to take on the dream job of owning your very own food truck. But as is often true in real life, the job isn’t always all fun and games. Food Truck Tycoon follows a now classic formula of food prep & serve found in such classics as Diner Dash, and countless games since then. You’ll start off in your food truck serving some basic items, and over the course of 60 levels, be rapidly preparing much more complex dishes from with inside your eatery on wheels. I found the game’s evolution of complexity with what you’ll be serving was well balanced, and if anything was a bit easier even in much later levels than anticipated. In the beginning you’ll be serving sausages and a drink, but a couple dozen levels in, and you’ll have to contend with salads, fries, condiments, and more exotic choices with customers that like a bit of everything. Gameplay itself comes in the form of selecting items and pressing a button to start preparation, followed by pressing the same button again a few more times to plate it, and then serve it. Having spent a lot of time with similar games on mobile and previous Nintendo platforms and then seeing the bubble buttons that make up the UI for Food Truck Tycoon, I was unpleasantly surprised to find no touchscreen support, which is just so typical for these types of games dating all the way back to the Nintendo DS. It’s a huge omission that really hinders responding to orders quickly. Instead you’ll be fiddling to move your directional pad buttons around to land on the right item. The game does its best to make button movement as easy as possible, and soft targeting on customers helps a lot still to mitigate the lack of touch control. When you’ve got the hang of cooking your dishes, you’ll definitely start bringing in the cash from happy customers. Cash is spent in two areas. The first place you will want to spend your funds in on upgrades. These come in the form of a larger soda machine, more plates to better prepare and serve with, and larger income from using some of the items too. These are necessary improvements as you make your way through the levels since they speed up efficiency and also earnings. Plus, it was also nice to see some visual changes inside my food truck. Your other spending point is on aesthetics for the dining area in front of your truck. Here you can purchase new trees, lights, tables & chairs, etc. Although a nice touch, there are a few things here that I wish would have been different to really entice me to want to spend my cash. In many diner games like this, you’re working to improve your restaurant, and there’s a clear differentiation from when you start your business to the late game. The aesthetic items available focused more on choice versus a progression. I had also hoped to see some beneficial boosts or buffs when purchasing these items to helping keep my customers around longer, or better revenue, etc. It’s a mechanic often seen in this genre, but also felt left out, resulting in purely cosmetic, but ultimately useless visual items. That’s not to say the game doesn’t look nice. The art is reasonably well done, and fits the cartoon styling. I do wish I could have done more to upgrade my actual food truck as well, but what you see is what you get for now. 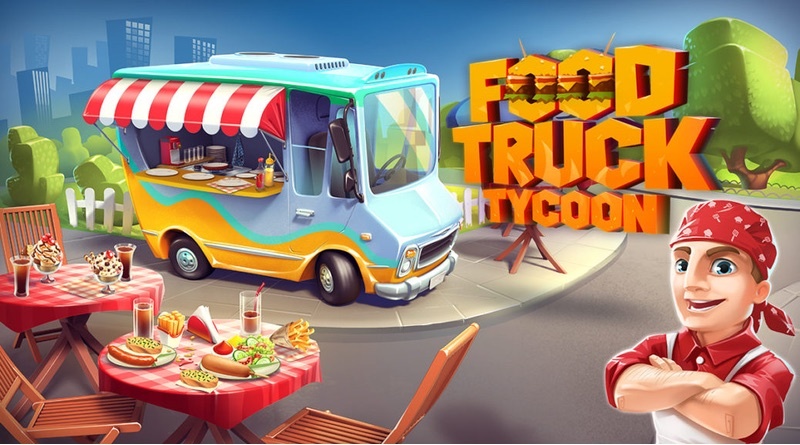 Regardless of depth seen in more refined games of this genre, Food Truck Tycoon doesn’t fail to bring the addictive prep & serve gameplay to players. The game is formulaic, but balanced well enough to avoid becoming too frustrating, and in fact might lean a little too far on the easy side. I was able to binge play this game just shy of completion in an evening, but with a $4.99 price tag, that’s not the worst value around by any means, even if I still wanted more out of my food tuck empire at the end of the day. Food Truck Tycoon doesn’t revolutionize the prep & serve food game genre, and ends up feeling undercooked with only 60 levels that can be completed in just a few hours. With no real replayability options, this becomes problematic, but luckily the $4.99 price makes it easier to swallow. Lack of touchscreen support is a glaring problem that will surely turn off some players.